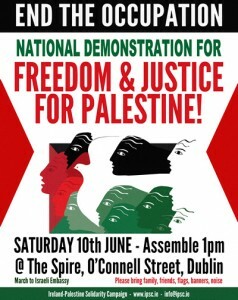 [Dublin] National Demonstration: End The Occupation – Freedom & Justice for Palestine! 100 years of injustice & 50 years of occupation is enough! It’s time for freedom, justice and equality for the Palestinian people! Show your solidarity with Palestine! The Ireland-Palestine Solidarity Campaign has called a national demonstration to mark the fiftieth anniversary of the ongoing brutal Israeli military occupation and illegal colonisation of the West Bank, East Jerusalem and Gaza, and 100 years of Palestinian resistance to the injustice that began with the Balfour Declaration in 1917 under which British imperialism declared that Palestine could be colonised by the Zionist movement at the expense of the indigenous Palestinian people. Assemble at 1pm at the Spire on O’Connell Street, Dublin 1*. March to the Israeli Embassy. 1) Join, Share & Invite friends to the event on Facebook here. 2) Tweet about it here. 4) Ask a friend (or several) to attend along with you. Please bring friends, family, flags, banners, noise. We would ask that you do not bring party-political flags (Irish, Palestinian or others). * Note this is a provisional starting point which may change depending on the LUAS works. Organised by the Ireland-Palestine Solidarity Campaign.